Britax Evolva 1,2,3 | What Car? The Evolva is an exceptionally ambitious and fully featured seat that covers three groups and caters for all well. 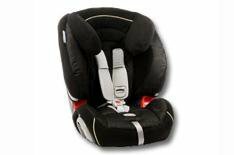 Its harness has six height adjustments and when removed leaves plenty of adjustment for when your child grows through the group 2 stage and eventually ends up using the seat as a group 3 booster. Adjustable side pads provide added head support for group 1 children, and there are two cupholders. Seatbelt routing isn't as simple as on single-group seats, but it isn't awful, either. It's a bit tricky to get decent tension, and a little awkward to get the belt located in the router when the headrest is in the lowest group 2 position. The Britax has good potential for saving you cash, if you can invest the time in learning how to use it as your child grows. Good materials, solid-feeling plastic and good padding make for a well-built and flexible design.